Description: 2637 waits in the power pit at Willard along with 2066 and 6316. Description: CSX 2637 originally in grey/blue scheme and her with yellow added minus the "CSX" on the nose. Description: Note the number plates mismatch. Description: Rounding the Toledo Wye south onto the Saginaw Subdivision from the Detroit Subdivision. Description: CSX 2637 still wears full Gray Ghost dress. 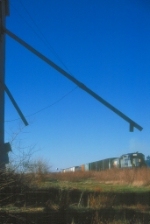 This photo was taken from the cab window of CSX 8350. Description: Southbound D716 with CSX 2637. Description: Y205 crosses over Mill Street with it's Chessie Caboose and heads back to North Yard. Description: Q418 with interesting 4-axle power next to the ex PRR North East Corridor which is now owned by Amtrak.